Following on from the disaster of my first attempt at step one of seed saving, when a slug ate its’ way into my secured female squash flower, allowing the bees access, I have been keeping an eye out for a second opportunity. 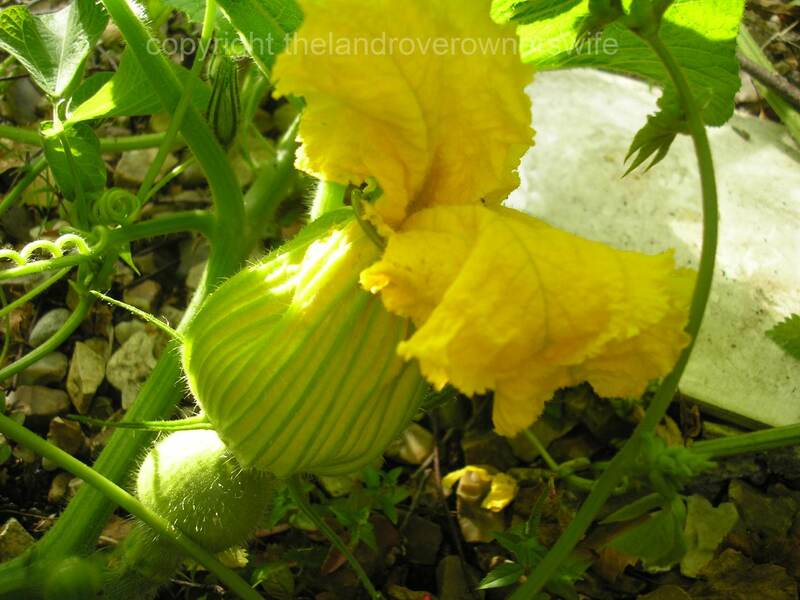 Then yesterday, during my usual evening walk around the garden, I spotted a pair of Anna Swartz Hubbard Squash flowers which it was clear to see, were due to open this morning. 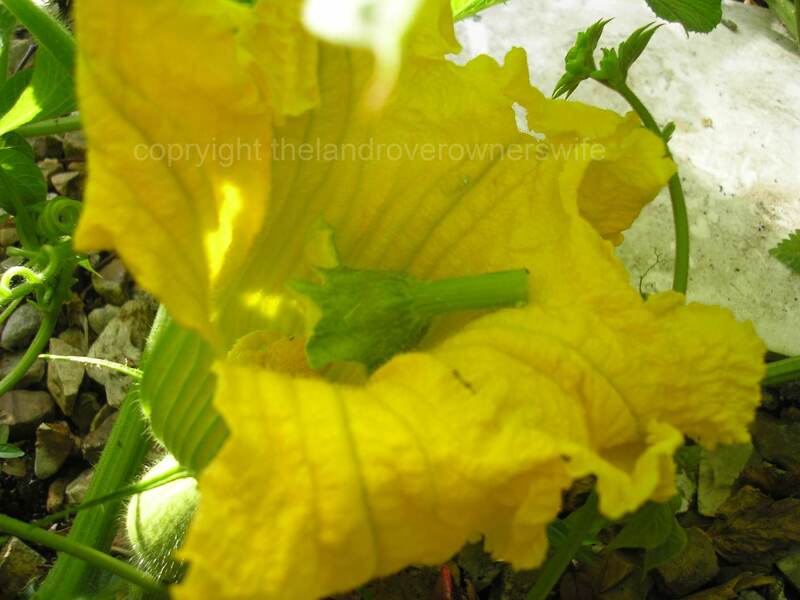 As I mentioned in my earlier post, it is really, really easy to predict when squash flowers are due to open – they just look ready, with the very tip of the flower looking loose and yellow and, well, just ready. Thankfully both flowers were very upright which boded well for them staying out of reach of any passing slug and so I grabbed a couple of plastic coated garden rings and secured both flowers. This morning, first thing, I popped outside to open up the greenhouses, grabbed my paintbrush and went to check on my flowers. Both were intact and the female was virtually bursting with its’ attempts to open its’ petals but I left it tightly fastened and went to retrieve the male, snipping it off the plant and carrying it, still fastened as there were a lot of interested bees and hover flies about, back to the female. The female was almost straining with the effort to open its’ petals this morning. Finally I was ready to unfasten the male flower and prepare it for the pollination process. The petals burst open as I removed the ring and revealed a huge amount of pollen which was a promising sight. I still hadn’t opened the female at this point as I needed to be sure that it was pollen from a male of the species which caused a squash to grow, if indeed one did, and I couldn’t risk a bee of hover fly bobbing in, with pollen from another squash variety or pumpkin, before I had time to prepare the male. The petals have been gently eased back and were then removed. My plan was to use a two pronged approach by first using my paintbrush to apply a load of pollen direct and then I intended placing the centre part of the male flower into the female before closing the petals up again. Obviously, the huge petals of the male would need to be removed first, to enable it to fit into the female flower and the petals of the female to be drawn back over and secured. Careful not to lose any of the pollen, I pulled back the male petals, gently removing them before using the paintbrush to gather some of the pollen. Next job was to quickly release the female and dust the center of the flower with the pollen laden paint brush, before placing the centre portion of the male into the flower, making sure it made contact with the stigma of the female and then I refastened the petals, leaving the male in place. 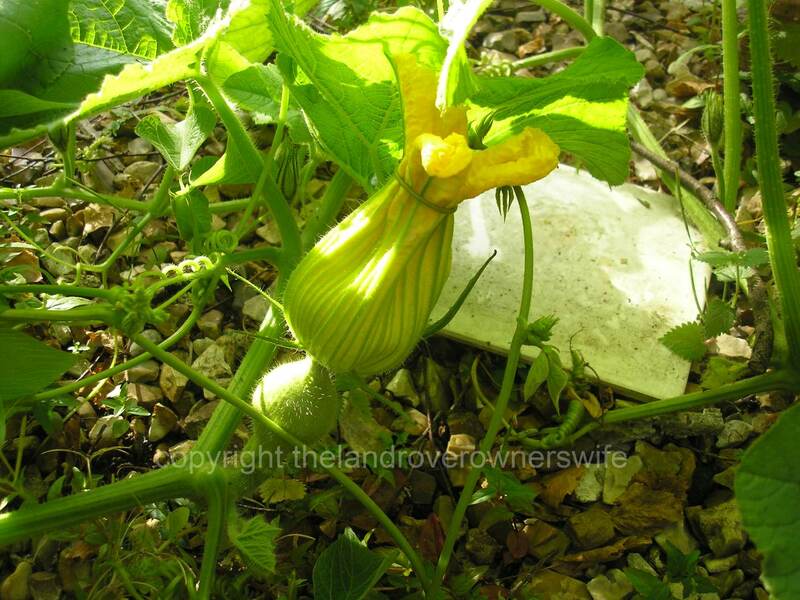 Only time will tell if pollination has been successful but I will be leaving the female secured until the flower has died back, at which point I will mark any resultant squash with a piece of brightly coloured wool, so that I remember which fruit has the ‘true’ seeds in it. 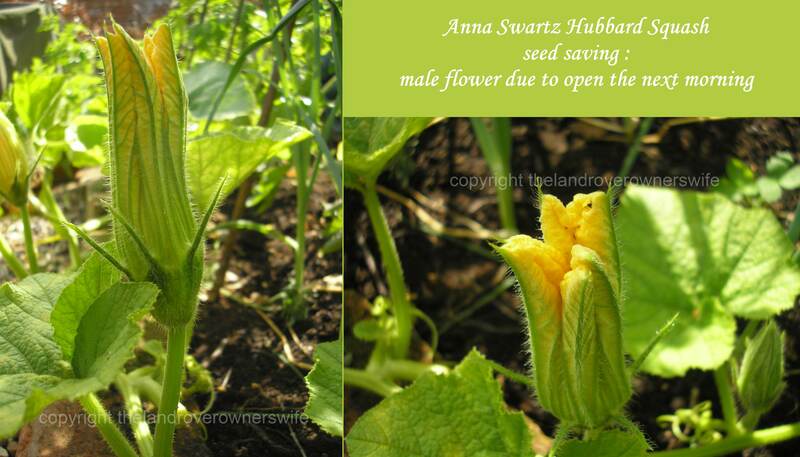 I plan to perform the whole procedure on another Hubbard female, in case this one fails or rots at a later date, as well as a couple of pumpkin flowers, although the Cheyenne Bush female flowers are a little harder to read and seem to open prior to the petals turning yellow which is odd. However, I shall give it my best shot and keep my fingers crossed for success. 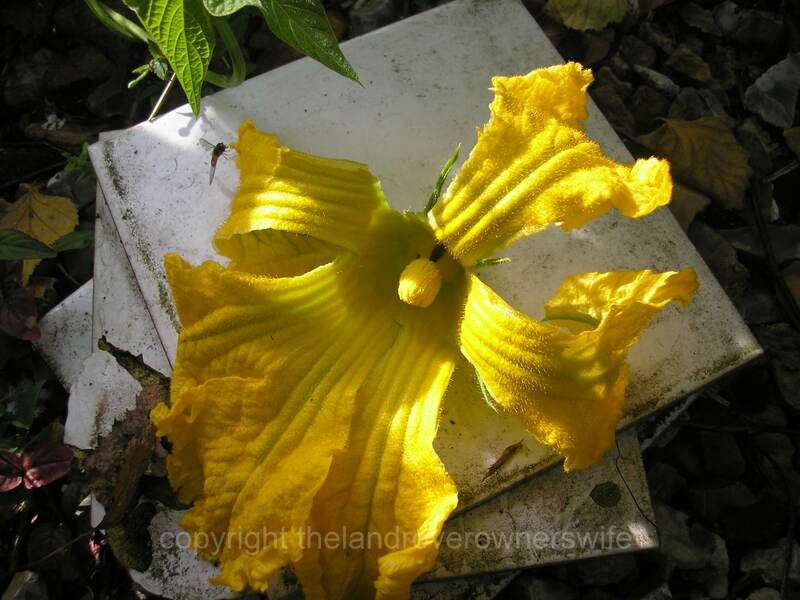 Lol, it’d be like the blind leading the blind – thankfully ‘How to Save Seed’ information was included with the seeds from The Real Seed Catalogue and so I’m merely following instructions 😀 Have just carried out the same procedure on a pair of Cheyenne Bush Pumpkin flowers I ‘secured’ last night! I work with a group of seed savers in Winnipeg, Canada, and I loved seeing the technique which you used for ensuring that the flowers did not open prematurely. It will inform our groups efforts going forward. We are presenting at a local conference and would love to use a picture or two from your blog in our presentation. Would you allow us to do if we give your blog credit? Thanks. First of all thankyou so much for actually asking permission to use the pictures, it is greatly appreciated. My husband is having a huge problem with photo theft from his technical land rover blog posts at the moment and is trying to find a solution. He really doesn’t want to watermark the images, as to do this effectively would invariably involve placing the mark through the centre of the components he was photographing, thereby compromising their clarity. Good luck with your presentation and thanks again.